XO to GO is a new premium Asian food deliver service offering “restaurant quality food” that must then be heated up before serving. XO to GO reckons its menu, with signature dishes from the XO restaurant in Belsize Park, is just the thing “for a dinner party cheat or a lunch at the office.” Based upon our XO to GO experience, we can agree with that. Here’s our review of this novel approach to takeout. 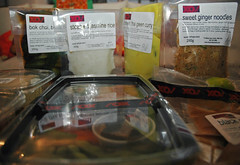 We were admittedly doubtful when our XO to GO order arrived at Londonist headquarters last night. Honestly, surveying the individual hermitically-sealed bags of curry, rice, noodles, et al – each with its own heating instructions – we wondered what we’d gotten ourselves into (and if we were going to have to scrounge for something else to eat)! Then, digging into our serve-cold starters of some intriguingly tasty bahn tran rolls and a sushi-filled Bento Box, we relaxed a little. Pre-heating our oven and popping open the door to our microwave, we prepared our dishes, hoping for the best. For just under £40, our dinner-for-two consisted of the following: the Bento Box, the bahn tran rolls, black cod with sweet miso with a side of sweet ginger noodles, Thai green curry with jasmine rice, a side of seasonal Asian greens (bok choy) and a piece of ginger cheesecake. Not cheap, but we reckon it was considerably cheaper but just as yummy as if we’d gone out for a comparable meal in a resto. We were particularly impressed with the bahn tran rolls: rice paper rolls stuffed with green mango, pomelo and pomegranate. The black cod wowed us too, and the green curry was just right. Seriously, while waiting for our food to arrive, we had whipped ourselves into a most critical frenzy, only to have it subside with due respect to the flavours the XO to GO experience presented. The instructions listed on the bags were spot-on (for our appliance settings anyway). Nothing needed reheating or required waiting terribly long to simmer down. Delivery time was roughly 40 minutes and prep time took about 20 minutes. The post-meal aftermath amounted to as much as expected from ordinary restaurant takeout or delivery. Portions were ample, with enough leftovers for a sizable lunch today. To find out more, check their delivery zone or place an order visit XO to GO online.